It’s getting harder to find nearby wastewater lagoons that accept septage. Whether a site has limited capacity or is unable to handle high-strength septage, it means many haulers are unable to empty their trucks locally, forcing them to travel farther to reach lagoons that can accept them. 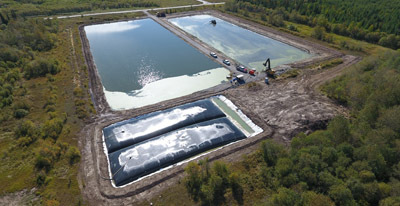 A simple, easy- to-operate upgrade to wastewater lagoons could enable virtually any site to accept significantly more septage without expanding the lagoon footprint, operate more efficiently and potentially increase revenue from septage disposal. The Bishop Solids Management Solution enables septage lagoons to make a simple process modification that enables it to accept high-strength waste and more solids without process upset or compromising capacity. To achieve these benefits, the Bishop Solids Management Solution, with Geotube® containers becomes the septage receiving point instead of the lagoon. Septage is pumped directly from the truck, or from a holding tank, to a Geotube®lagoon, loading, reduced footprint container, which provides both containment and dewatering of the septage. As the septage is pumped into the container, it first passes through a 1/2-inch bar screen to separate unwanted solids such as trash and other debris. Then, a specially selected polymer is added, which enables the solids to begin dewatering and filtrate to flow through the container’s tiny pores almost immediately. This filtrate is collected by a non-permeable membrane and directed into the adjacent treatment lagoon. To cope with the high levels of contaminants and nutrients that this filtrate may contain, Bishop Water can also retrofit a lagoon with its BioCord Reactors, a self-regulating, low-energy technology to achieve enhanced biological removal of nutrients and BOD. The modular reactors provide a high density, vertically oriented surface area—like a condominium for bacteria—that functions as an ideal medium on which to establish a stable, concentrated biofilm. This robust population of microorganisms is resistant to high hydraulic and organic loadings and dramatically improves the performance of the lagoon under normal and upset conditions. 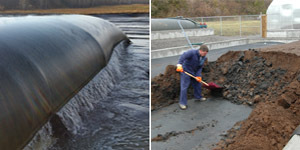 Learn more about using Bishop Water’s solids management solution at a WTP. Read our recent article in OOWA Onsite Magazine. 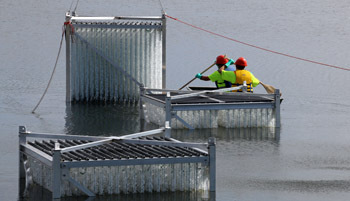 Contact us to discuss affordable process upgrades to your septage lagoon. Site Administration & Hosting by TUBMAN Marketing Inc.